DENVER — If that turns out to be the great Peyton Manning’s last game, we’ll all certainly understand why. Manning turns 39 years old in little more than two months, which means 40 is less than 15 months away. On Sunday against the Indianapolis Colts, it looked as if that day might already have arrived, for Manning looked every bit his age in a dispiriting, 24-13 loss to his old team, the ninth time in his storied career that he has led a team into the playoffs but has not been able to win a game. It was as if the Denver Broncos veteran was aging right before our eyes, scattering inexplicable mistakes throughout the game. In his post-game news conference, he all but confirmed that he realized that too. When he was asked if he was coming back next season as planned, he said he could not answer, a striking departure from his recent comments that he would definitely return in 2015. 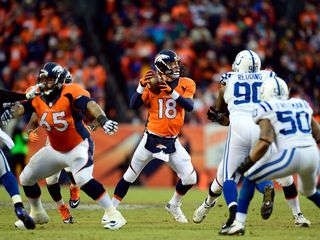 Pressed further on the issue, Manning would not commit to returning next season. It was a stark realization that he saw what we saw in his uninspiring, mistake-prone performance, and was now going to have to deal with it. The Peyton Manning of old would not have had all the badly overthrown passes – six in all – when the Colts defense took away his options in the middle of the field. The old Manning would not have failed to run when 20 yards of open field stared him in the face on third and five at his own 25 on the first drive of the second half. No, the old Manning had just turned into an old Manning. Broncos Coach John Fox wasn’t pleased with Manning’s decisions either. “We did probably go to that well too many times,” he said. Walking gingerly, appearing to slightly favor his injured left thigh, Manning was nothing like the quarterback Americans have come to know and respect. He was booed early and often in a surprisingly lackluster effort. But something clearly wasn’t right, not only on this day, but as the long season went on. Now, he and the Broncos have some hard decisions to make. Follow columnist Christine Brennan on Twitter @cbrennansports.